Imagine a Fair Trades Up penny game in Two Land between two players, Lion and Tiger. They’ve been playing for a while, and Lion has one Flat, one Long, and one Unit Cube on his activity board as shown at the top of the next column. Let’s see if he wins on his next coin toss. Lion tosses a tail, so he puts two Unit Cubes on his board. 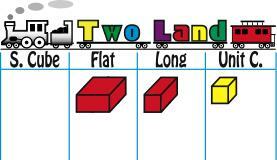 Play the Fair Trades UP penny game in Two Land and Three Land with the Fair Lands blocks. Then play it in at least one other land with counters. If are available, play it in Ten Land, too, but just a little because the bigger the land, the less practice on trading. In playing the game, stress KISS, an acronym for “Keep it safe and simple,” meaning keep activity boards safe and trades simple as explained in the instructions for the game. This ensures working right-to-left and column-by-column like in arithmetic. Too many Unit Cubes! 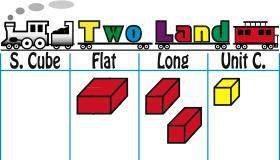 So keeping it “simple,” he trades two Unit Cubes for a Long (not two Unit Cubes and the Long for a Flat). Too many Longs! So keeping it “simple,” he trades two Longs for a Flat (not the Longs and Flat for a Super Cube). 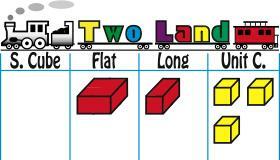 To add with the Fair Lands blocks, elementary school students need to learn when and how to trade “up”: little blocks for big ones. This is taught by having them play the Fair Trades UP penny game where they toss a coin and add units to their activity boards one or two at a time depending on the toss. Afterwards, they “legalize” their boards if they end up with more of the same block than is allowed.